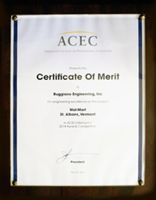 Founded in 2004 and headquartered in St. Albans, Vt., Ruggiano Engineering, Inc., is an established leader in the development and operation of the infrastructure necessary to meet a community’s needs. We have extensive experience in multi-market sectors including land use planning, transportation, municipal water/wastewater, building rehabilitation and community development. Our experienced team of civil engineers provides the consulting, engineering and planning services essential to move a project from conception to completion, including operation and maintenance. It’s our mission to develop projects that contribute positively to the needs of our clients and communities.